Glock just released three new models to flesh out the 9mm line! They are the G45 and Gen 5 versions of the G19 MOS, and G17 MOS. A very limited number of folks were able to try out these new heaters from Glock before they hit the shelves. Now luckily you, the faithful readers of Pew Pew Tactical…will be in the know. Glock started the Gen 5 rollouts a while back with the G34 and G26. Both are excellent choices in 9mm, one (G34) being the big daddy long-slide competitor and the other (G26) being the stubby concealed carry or backup gun. Gen 5 essentially meant the guns all shared some common traits. First, they were coated in a diamond-hard nDLC finish which is super black. This exterior is tough and also have lubricious properties. In addition, the Gen 5’s were given the Glock Marksmen Barrel, promising improved accuracy. One of my favorite upgrades was the flared and beveled magwell, greatly aiding in reloads. The trigger was better, being smoother and having a quicker reset. 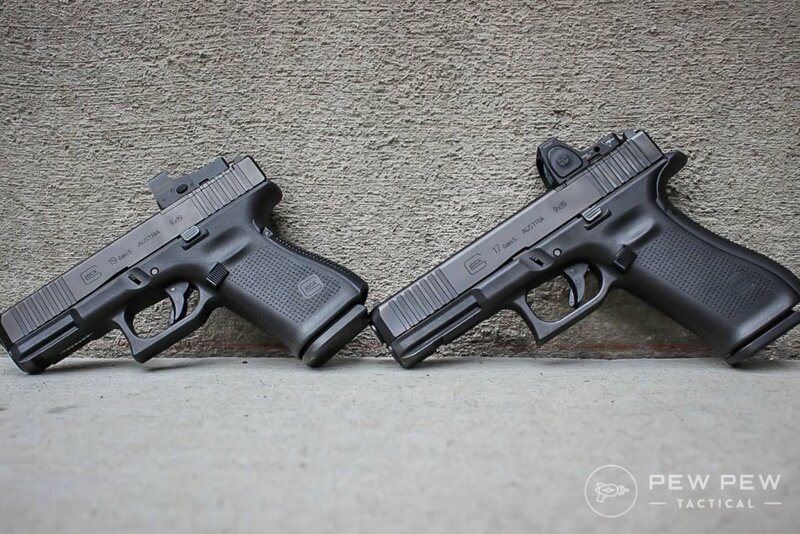 Concealed or duty carry, the G19 MOS (left) and G17 MOS (right) have you covered. Plus, the magazine was given an orange follower which visibly indicated an empty chamber as well as showing you how many rounds were present in the magazine. The Gen 5 G17 and G19 MOS were just added to the line. These are likely two of the most prolific handgun models in the world right now and their Gen 5 MOS upgraded versions are a credit to their lineage. The Trijicon RMR Type 2 (left) and Burris Fastfire 3 (right) are great MOS options. They are still essentially the same, the G19 being the compact version, and the G17 being the full-size, though they benefit from the Gen 5 enhancements and something new – forward slide serrations! 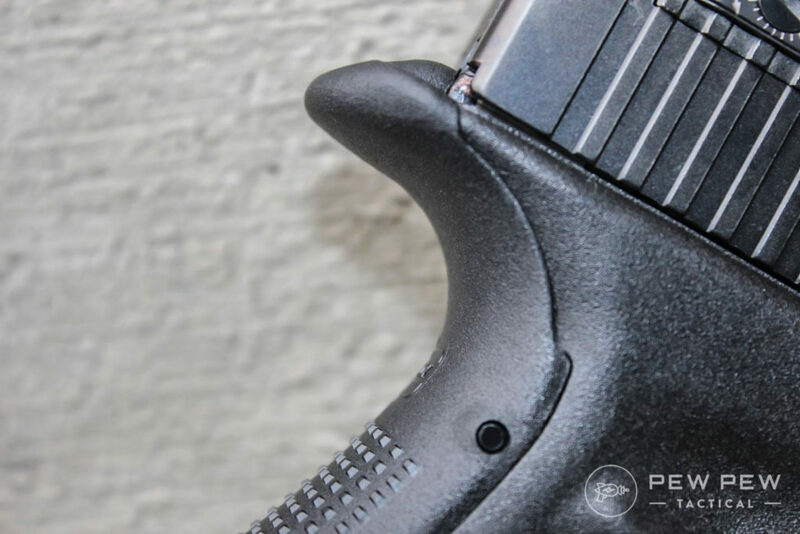 If you’re unaware, some shooters enjoy forward slide serrations because they allow the user to press check and even reload with their support hand not dropping the rear of the slide. With a reload, the shooter simply grabs the slide up front, pushes the gun forward, releases the slide, then marries up grip with both hands. This is as opposed to racking the slide (support hand) from the rear with the gun hand driving forward, forcing your support hand to recover grip from being further behind the gun. It’s not a .45 caliber. This is an issue for some people though it is lost on me. Glock has never produced a model number that coincided with a caliber of the same number. But while we’re here in Distractionville, check out the G41, it is a tack-driving, 230-grain delivery system. The G45 is an evolution from the G19X appealing to the needs of law enforcement. When the new Gen 5 Glocks released, another impressive idea from the Austrian gun manufacturer came out simultaneously—the G19X. This gun was the result of Glock attempting to fill the requirements for the U.S. Army’s MHS contract. Glock called the G19X a crossover, a combination of the G19 slide with the frame of the G17. Why? The idea was you’d get the concealability of the G19’s shorter slide with the expanded capacity and grip of the G17, a marriage made in heaven. In response, many people professed to want a blending reared of the opposite values, namely; a long slide with a shorter handle. The Army ultimately selected the Sig P320 with what can only be described as mixed results due to a drop safety concern which Sig ultimately corrected. The FBI still selected Glocks to fill their 9mm needs and this chain of events may have inspired Glock to reach out to one of its larger markets, law enforcement. 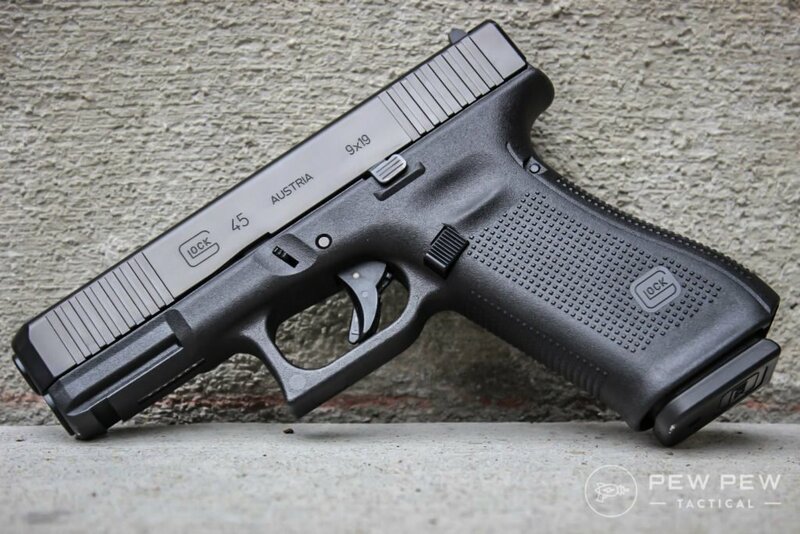 The G45 takes the idea of the G19X crossover, combines it with the upgrades common to the Gen 5 series, and then enhances it with forward slide serrations. It is a wonderful combination that is largely targeted to that law enforcement market. The gun is black, unlike its predecessor, has the frame of the G17, and the slide of the G19. For specifics, the slide on the G45 is 6.85 inches according to the Glock website. The G17 Gen 5 MOS FS has a slide of 7.32 inches… roughly half an inch longer so we’re not talking enormous differences. However, when it comes to grip, size is critical. My gloves are 2X, and this means if I don’t use at least the “M” size backstrap add-on piece with the extended beavertail (since Gen 4) I will be experiencing some slide bite. With the G17 frame, this is less of a problem. Regardless, Glock has you covered as the fit is adjustable. Call me a fanboy, but at this point in my life if Glock made something that didn’t just perform I would be surprised. The gaping maw of the Gen 5 magwell just begs for reloads. Please keep in mind that I am not a concealed carrier only. I have served in law enforcement for 20 years now and have utilized firearms professionally for that duration. I’ve never understood faulting someone for praising something that absolutely works, other than the tribalism that seems so rampant in our modern society. That being said, I had a chance to take all three guns out to the range and wring them out before many of you will even see them on the shelves. In short, they hold up to Glock standards, which are high in my opinion. I ran a few different brands of ammo through them and found them to be wholly reliable. This wasn’t an exhaustive test, but an introduction. Don’t forget to look at the Best 9mm Ammo for Self-Defense & the Range. 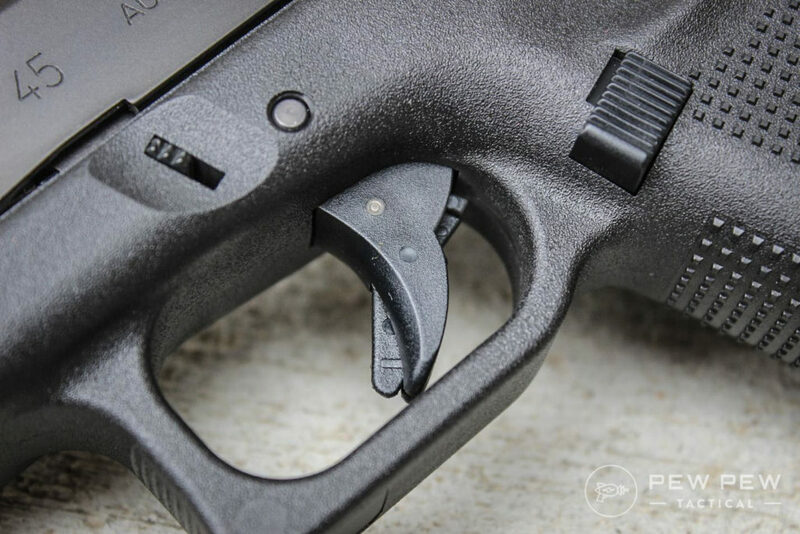 The smoothed-out trigger will impress previous Gen Glock shooters and the reset is surprising! The G45 handled similarly to the G19X I had tested before. I am a big fan of the flared magwell though, and the forward slide serrations. This just makes sense to me. I was able to engage my target at various distances and reload using the flared magwell in conjunction with the forward serrations. Ultimately, I believe this process will become faster for me with practice. The benefits of the crossover were evident to me immediately, I was able to maintain a substantial grip on the weapon without slide bite and it was still small enough to conceal with minimal effort. Let’s be honest, this isn’t a bikini gun, but you can tuck it away with some planning. I had good accuracy with the standard Glock sights, though this is always a minimum standard and can be improved upon. The Gen 5 G19 and G17 MOS were impressive. Individually, I mounted the Trijicon RMR Type 2 on each gun for testing. I use this micro-red-dot on my Gen 4 G17 duty carry and am very familiar with it. On the G19 it was dead on and I punched a ragged hole in my target. On the G17 it was slightly left for some reason and I still punched an ever-growing, ragged hole in my target. I find the MOS system allows me quicker sight picture and recovery after recoil. As I mentioned above, I have had other guns just fit my hand better out of the box. That being said, the newer generations of Glocks do a great job of fitting a wide variety of hand shapes. And for those who are left-handed, the Glock can be converted to suit you! I have hit man-sized targets with my Gen 4 Glock at 100 yards. This is not optimal for obvious reasons. With any luck, if I’m shooting that far, I’ll have a rifle in my hands. All this aside, the Glock Marksman Barrel is supposed to be capable of putting up 4-inch groups at 50 yards. That’s impressive. While Glock isn’t the most beautiful firearm in the world, it is one of the most reliable. You can bury them in the ground, drag them through the mud, even hold them underwater, and they will still work. I have had some high-end pistols that were finicky with ammo, the Glock shoots everything I’ve thrown at it. Because of the sheer amount of these guns in the world, there is a large aftermarket, meaning there is a lot of customization options. Sure, you can add a flashlight, laser, whatever you want to the rail, but when it comes to actual customization, the Glock is top of the heap. There are so many companies doing custom frame stippling, slide milling, hell, the whole P80 market is due in some part to the success of various Glock models. If you’re interested in building your own Polymer80 Glock, we got you covered! But they won’t come in the G45…yet! We also got the Best Glock Mods and the best Glock Magaiznes! As much as I like Glocks, I have to be honest. They aren’t as attractive to me aesthetically, as say a 1911. However, they are terribly functional, and that is an aesthetic in and of itself. Function > Form. While I have not seen MSRP on these models yet, I feel like Glock does a great job with creating value. If performance and all other aspects are the same, the price of these guns is incredibly competitive compared to other companies. Some folks will react to the news of new Glocks with a “meh” mentality. I fall into the other category. I use my tools professionally and think any advantage I can gain in a possible gun fight is an investment worth making! If I never have to use it, so much the better. But if Valhalla should call upon me some day I shall not go lacking to my adversaries. I understand this doesn’t apply to everyone, but you big-handed shooters out there, use the Glock backstrap with the extended beavertail, you’ll thank me later. Irrespective of your position on Glocks, these three new models are some of the best offerings you can find on the current handgun market in my opinion. Many of the features seen on these models are a direct result of Glock’s watching the aftermarket and seeing what customers want. Glock reports the new pistols are shipping out now and will be on gun store shelves starting October 5th. I can give them each my full recommendation, having fired them all. The Gen 5 models, having been upgraded with forward serrations and flared magwells, are outstanding editions to anyone who carries, be it out of a sense of self-defense, or professionally in the defense of others. If you do plan on getting one of these new offerings from Glock, don’t forget to look at our 4 Best Pistol Red Dots article to find the right optic for it! What do you think about the new G45? The Gen 5 in general? What about the MOS Glocks?! Tell us in the comments! Sean Curtis is a nationally published writer who covers guns, survival, and law enforcement, his articles have appeared in multiple print and online publications. He is still active in law enforcement, with 20 years experience. I think Glock lacks innovation. They really haven’t made any improvements to their guns. The trigger guards are still too small, the finger groove under the trigger guard is old fashioned and inadequate, the hump at the bottom of the backstrap is still providing their pistols with ergonomics that don’t work for people who are not fan boys. And the “Marksman barrel” is a joke. No one is buying this thing for precision shooting. Glock will round the corners more on their next Gen. and call it an improvement. When is there going to be a G19 GEN5MOS without the MOS? The wait continues for my Glock Unicorn…G26 slide/barrel (with forward serrations, nDLC coating) married to a Gen 5 G19 receiver (of course short enough to fit the reduced slide length but with the Gen 5 frame features: flared mag well, removed finger ridges, etc…). My main concern on the MOS model is just how reliable are the threads going to be? Will the threads strip? Loosen? Backout? How much purchase? How much abuse will the threads/plates take? Would it be better to mill the slide? How much better is a milled slide? 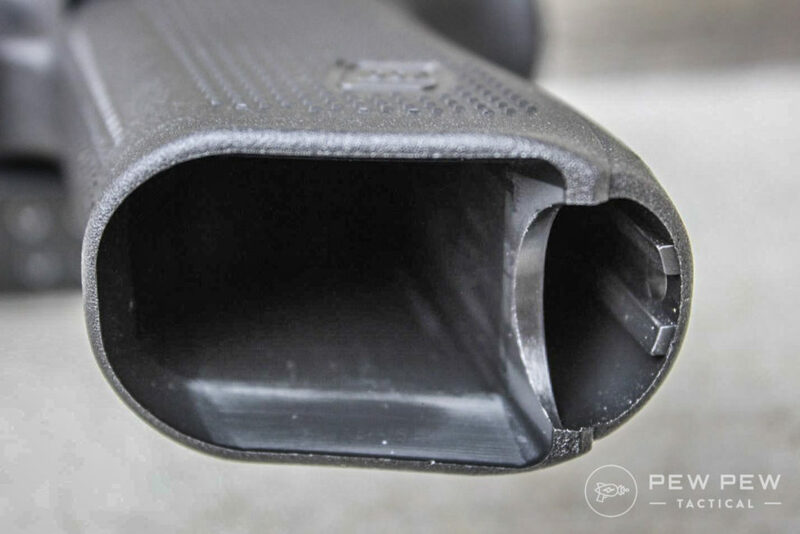 And finally, who does the best milled slide and retreating the metal to look OEM? I’ve carried the Gen 4 G17 MOS on duty for a little over a year and have had no issues with threads whatsoever. I’ve switched out optics and changed mounting plates and had no problems. I also shoot quite a bit so my gun is no safe queen. Using blue Loctite likely helps with this. I can’t compare it to having a slide milled by a gunsmith as I’ve never done that, but there is some motivation to move to the Gen 5 in my mind anyway since you get some other great upgrades. Hope this helps. I didn’t see boasting here. Curtis knows Glocks and – from what I can tell – appreciates their value. Bottom line – they’re reliable, shoot smoothly, and if they aren’t the prettiest gun, which is an opinion, then whatever. You don’t have to nitpick. I think he gave a “plethora” of valuable info for prospective buyer. You sound more like someone who is trolling for an argument rather than making a good one. Your “argument “ is really just negative criticism that is, imho, unsupported.